1. Being twice as much in size, number, or value. 2. Consisting of two identical, similar, or equal parts. 3. Designed or intended for two people: "We reserved a double room at the hotel." 4. Describes bedding of a size that will fit onto a double bed. 5. 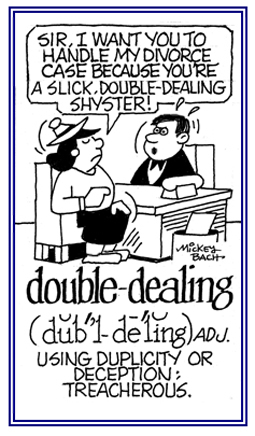 Etymology: from Old French duble, from Latin duplus, "twofold"; from du-, "two" + -plus, "fold". Relating to dishonest or deceptive behavior: Manfred went to a double-dealing lawyer in order to claim a bigger refund for his car than the auto company was willing to pay. © ALL rights are reserved. 1. Evasive or ambiguous language. 2. Language that has no real meaning or has more than one meaning and is intended to hide the truth: "He accused the ambassador of diplomatic double-talk."